Red blood cells are just one of three types of blood cells in your body. A low red blood cell count is a common side effect of cancer treatment. But before we dive right in to the effects of low rbc counts, check out this article, to get a good overview of what your blood is made up of, and how the red blood cells fit in to the whole scheme of things. Red blood cells (RBCs) are vitally important to your existence. And they have the great distinction of actually being red. When we are cut, we bleed red, you can thank your red blood cells for that. Red blood cells contain a protein called hemoglobin, and you can thank them for carrying oxygen from the lungs to the rest of your body. Pretty important job. If you don’t have enough red blood cells/hemoglobin, you won’t have enough oxygen, and things can get ugly fast. We’ve found that out first hand when mom experienced a low red blood cell count. Mom’s main run of chemotherapy has been with Gemzar or Gemcitabane. We have been pretty tickled that she hasn’t lost her hair on this chemo. Everyone asks about her hair – must be the most asked question when they find out she has cancer… So, no she hasn't lost her hair. BUT she has experienced drastic blood count drops on this drug. Of the two side effects, I think we’d take hair loss in a nano-second! The destruction from the chemo hits all 3 types of blood cells; the red blood cells, the white blood cells and the platelets. For this article, we’ll concentrate on what happens when you have a low red blood cell count. Because most chemos and radiation can also cause fatigue, sometimes patients don’t even give a thought to their bone-wearying tiredness. Good thing most oncologists do blood tests before each chemo treatment. The blood test is a simple, quick test called a Complete Blood Count, or CBC, for short. The blood test will check your level of red blood cells and your hemoglobin. If your blood test reveals low levels for either your red blood cells or your hemoglobin (if one is low the other usually is too), your oncologist will need to determine if the cancer treatment should continue or if you might need medical support to treat the low rbc count. There are several drugs that your doctor may use to help reverse the low red blood cell count. One is called Procrit and one is called Aranesp. He may also suggest you take an iron supplement and/or a multivitamin. And if your counts are in the critically low range, he may go right to a blood transfusion. The first was during her emergency gall bladder surgery. The second was during a systemic streptococcus viridians infection that landed her in the hospital. In both instances, we attributed her weakness, shortness of breath and utter fatigue to these medical complications. And truly, that was part of it, but the critically low red blood cell count and low hemoglobin was just as much a part of the problem. So grateful for that little CBC blood test. And for that little pint of red blood. A Blood Transfusion is a simple thing for the patient. 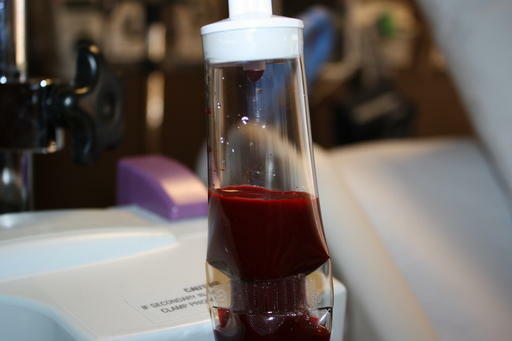 It involves a small needle stick and then the bag of blood is allowed to slowly drip in, much like a bag of I.V. fluids. 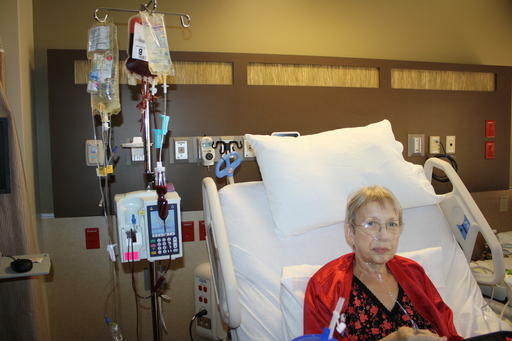 For mom, the pint transfusion took approximately 3-4 hours. She had no adverse reactions and was feeling a little stronger within hours. And Blood Transfusions are so much safer now than 20 years ago. Each donor is tested, then the blood is tested, and tested again, then finally matched and cross-matched to each patient. Two different nurses came in to draw mom’s blood for the match, and then the bag was checked and double-checked before being hung and given to her. The care taken with each blood transfusion is completely necessary. If your blood is not properly typed and matched, a reaction could occur. 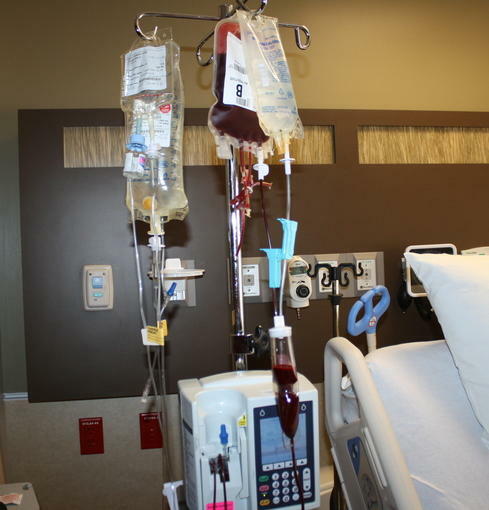 For a more detailed explanation, check out this article on Blood Transfusions. Mom’s experience with low red blood cell counts is ongoing. We imagine that as long as she is pursuing the chemotherapy to keep the pancreatic cancer in check, she will be dealing with the side effect of low blood counts. I can’t close this topic without referring you to our ongoing experiment with a health supplement called Barley Life. A good friend recommended it to us as a means to keep mom's blood counts up during chemotherapy. It had worked well for her when she battled ovarian cancer. Mom's doctor gave us the okay to try it, and we are chronicling our experience with it Barley Life here. 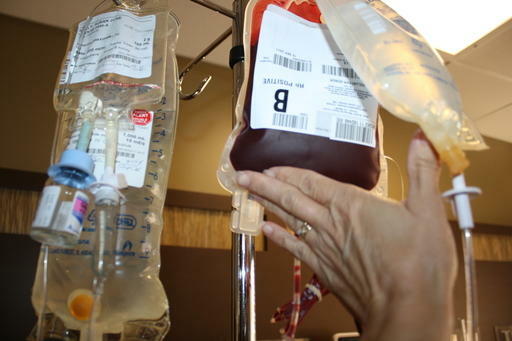 Low red blood cell counts have become a major side effect of the cancer treatment for mom. But the blood transfusions have given her renewed energy for the fight. We are humbly grateful for the blood donors that have given their precious time and the life blood that lifted mom up during a critical time on her pancreatic cancer journey. Wherever you are, whoever you are, your selfless gift has blessed us.